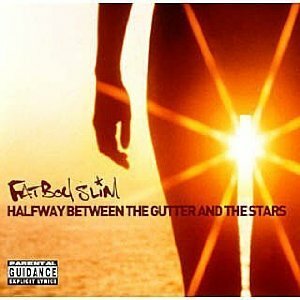 CLUAS | Album Reviews | Fatboy Slim's "Halfway Between the Gutter and the Stars"
After the rabble rousing adrenaline rush of an album that was ''You've come along way" it didn't come as much of a surprise that the new album from Fatboy Slim is slightly more chilled. It saunters to a start with 'Talking bout my baby', a laid back tune complete with piano, soulful vocals and Jackson 5 style guitars. Allow me to focus on the good moments for a minute and I'll skip next to track four 'Love Life' which features the ever gorgeous voice of Macy Gray. A great song chock full of funky guitars and deep bass, it gradually descends in a beat laden frenzy. We now pay a visit to track ten next - 'Demons' - a brilliant song which is the absolute highlight of the album. Once again Macy Gray is in charge of the vocals. This girl can do no wrong. Her voice is smooth, funky and soulful and the song is a seriously strong one. With these three songs being as good as they are, the rest of the album was always going to be in the shade. In truth though, the rest is not so much in the shade as in darkness. 'Star 69', 'Ya Mama' , 'Drop the Hate' and ' Retox' are all fun packed with dodgy beats and repetitive samples. 'Ya Mama' is especially corny with a cringe inducing sample of 'push da tempo'. Contender for most irritating song of the year is 'Sunset (Bird of Prey)' with that horrid Jim Morrison sample. Ugghh. The rest of the album is in the same field. Not hip nor happening, just annoying. Overall this was a disappointing album with only a few splashes of brilliance.